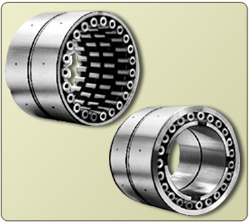 Roll neck bearings are very heavily loaded and subjected to high pressure. They are used where space restriction in radial direction is very severe. This is a bearing of low section heights with high load carrying capacity. The available mounting space should be primarly used to accommodate the radial bearings since by comparison to the radial loads, the axial loads are relatively small. 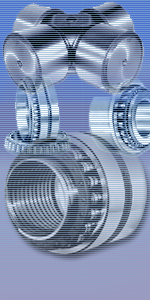 accommodates larger diameter roller than a spherical roller bearing or a tapered roller bearing. Since the Roller diameter is the factor with the strongest impact on the load rating, the Cylindrical Roller has the highest load carrying capacity when compared to the other bearing types-on the basis of identical boundary dimensions. A high degree of accuracy can be achieved with bearing comprising of parts of simplest geometry. Expending the same amount of workmanship the Cylindrical Roller Bearing will therefore exhibit a higher running accuracy than the tapered rollers or the Spherical Roller Bearing. For high speed rolls the low rolling contact friction characteristic of the Cylindrical Roller Bearing is highly favourable. Within a given mounting space Cylindrical Roller Bearing offer the greatest load carrying capacity. This bearing is suitable for highest radial loads and owing to its low friction coefficient, for highest speeds.